What's Different About UE Political Action? UE members at a rally for workers' rights in 2011. UE considers taking direct action in support of working people a crucial part of political action. 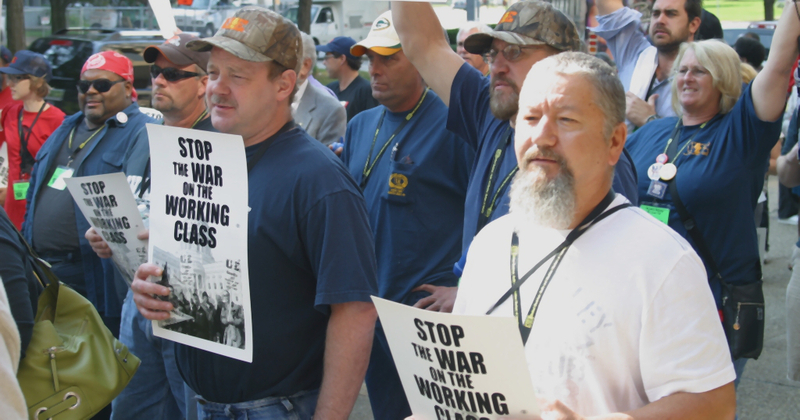 Political Action is the organized effort of working people to make our voices heard by our elected public officials in order to win government policies and programs which benefit working-class Americans. UE engages in independent political action as part of the union's aggressive struggle to win better conditions for our members and all workers. UE political action is about educating the membership on the issues, and then mobilizing the membership to take action in their own interests. We promote political solutions for the problems that union members and working people face, and we utilize the political arena to defend ourselves against attacks and the politicians who launch them. This is serious business. The victories we win at the bargaining table can be easily either taken away or reinforced by the action or inaction of our government (local, state and national). There are also issues and problems that we face which cannot be addressed at the bargaining table, and as working people we have the right to expect that our governmental bodies and representatives will respond to the needs of the people. Consider how labor laws, tax laws or our nation's health care and social security systems affect our lives as workers. Even as we are engaging our employers in our workplaces, these same employers are attacking us on a second front, using their financial resources to buy thousands of lobbyists and make millions in political contributions. Their goals are laws and policies which boost their profits, usually at our expense. We have to fight on this second front, too, but we'll never match the corporations dollar-for-dollar in politics. Our best hope is mobilizing the people - that's something we have a lot more of and the real source of our strength. UE's particular style of political action education and mobilization — based on the issues — has stood the test of time over our 80+ year history. In fact, a history of political activism by UE's rank-and-file members has earned our union an enduring reputation as a respected, progressive voice in the American labor movement. WHAT DO WE MEAN BY "INDEPENDENT" POLITICAL ACTION? "Independent" means independent of the two major political parties (Republicans and Democrats). UE maintains that both parties are too closely tied to the wealthy and big corporations to be dependable advocates for working people. UE political action is issue-oriented. We "independently" formulate our own political goals - not taking them from any political party or other group - then fight for them through political action. UE policy and issue positions are debated and voted on by rank-and-file delegates at UE national conventions. All locals and regions are encouraged to submit policy resolutions at the convention. If no local or region submits a resolution on an important issue, the General Executive Board of the union may ask the delegates for permission to submit a resolution to the convention on the subject. UE Policy can be found at ueunion.org/ue-policy. DOES UE'S APPROACH DIFFER FROM THAT OF OTHER UNIONS? Yes. Because UE emphasizes rank-and-file involvement and grass-roots-style activism to a much greater extent than many other unions. UE, for example, doesn't have a national PAC (Political Action Committee) to contribute money to candidates, an approach that for many unions has become a substitute for mobilizing the membership. We organize people - not their wallets! — UE Secretary-Treasurer James Matles at the 1975 UE National Convention. WHO DECIDES WHICH CANDIDATES UE SUPPORTS? The members do! In fact, most endorsements are made at the local union level using the political program adopted at UE national conventions as a yardstick. UE locals endorse candidates who have shown by their records, not by their rhetoric, that they will represent the interests of working people. UE also promotes the recruitment of candidates from the ranks of labor to serve in public office.